We write this as we return from our final coin show of 2016. This week’s PCGS Invitational was an interesting event as we entered with very low expectations based upon the timing near the end of the year and the lack of time that many dealers have to prepare for the upcoming FUN mega-show. The beginning started as expected on Tuesday and Wednesday morning but by Wednesday afternoon, we were bombarded with late arrivals, and it turned into an active event for us. In fact, it greatly surpassed our expectations and further cemented the idea that we truly believe the coin economy is on the upward swing. While the wholesale coin market has faded over the past decade due to the over-grading of some coins, the lack of eye appeal on many issues, and several legendary coin buyers “retiring,” the increased volume in internet based dealer transactions continues to thrive. Although, the coin hobby is behind many other industries, it is still far ahead of other collectible hobbies, and it gives us an absolute renewed hope that the future is bright. As many have pointed out, there seem to be some excellent values on the market, and I wouldn’t argue against that as we’ve procured some really special coins lately at very agreeable prices. However, the supply is certainly finite and it is becoming harder and harder to source these. In our opinion, the market is going to continue to improve in 2017, and we hope that we get the opportunity to work with you and your collection, whether it be buying or selling. As for this week’s CWL, we are offering some interesting auction highlights from several recent collections and purchases. Of course, if you need a little extra time for payment due to holiday shopping obligations, just let us know, we can be flexible on all of the below offerings, and we’d love nothing more than to be able to work with you. Thanks again for reading, and we hope that you enjoy this week’s installment of Coins We Love! Why we love it: This is truly a special offering and a coin that has not been on the market for quite some time. The display of gorgeous, original surfaces and a light golden green toning highlight the beautiful luster. It came to us from a long-time collector, and it is the finest of the issue that we’ve ever offered. Value: Reserved in auction for $11,500, it is one of the finest offerings available. With only four pieces graded finer, that have never been sold publicly, we expect this piece to find a home with an advanced collector. Why we love it: A perfectly choice Fine example of this first year of issue Flowing Hair Half Dollar with the coveted CAC sticker. The smooth planchet and overall quality eye appeal are the highlights of this underrated issue. CAC has stickered only five examples of coins in this grade. Value: PCGS Price Guide lists this date and grade at $12,500. The scarcity of quality CAC-stickered pieces make this coin a delightful offering with a reserve of $11,500 in this week’s auction. 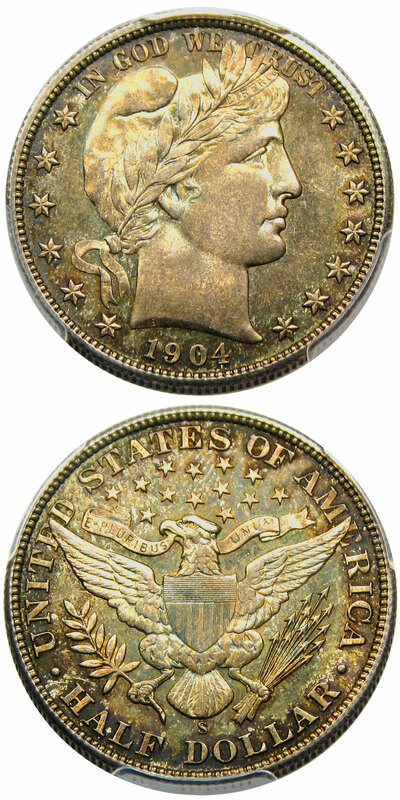 Why we love it: Not only is this coin a delightful coin with pristine surfaces and gorgeous original luster, but the scarcity of the date from the Civil War era only adds to the allure of this coin. Astoundingly gorgeous in all aspects, the 1861 $3 is bested by only four PCGS-graded pieces. 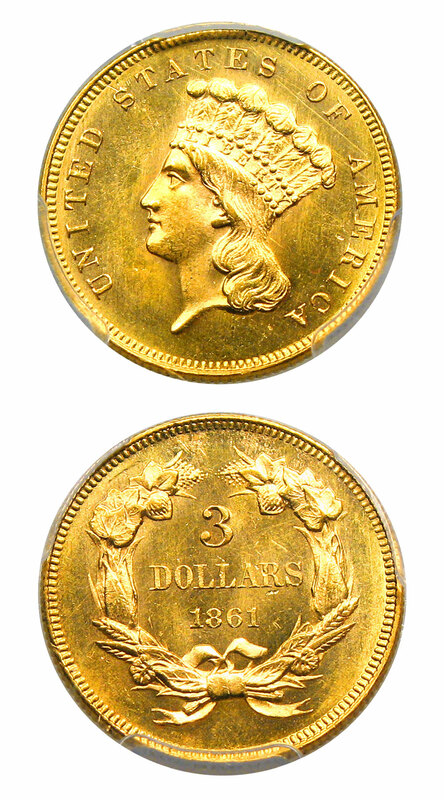 Value: Since the sale of the amazing Pogue Collection of $3 Gold Coins, we know of at least three collectors that have started Registry-quality collections of this very limited series. Unfortunately, the pieces that were decidedly under-valued in the actual February auction have now jumped in price as they are simply not available. 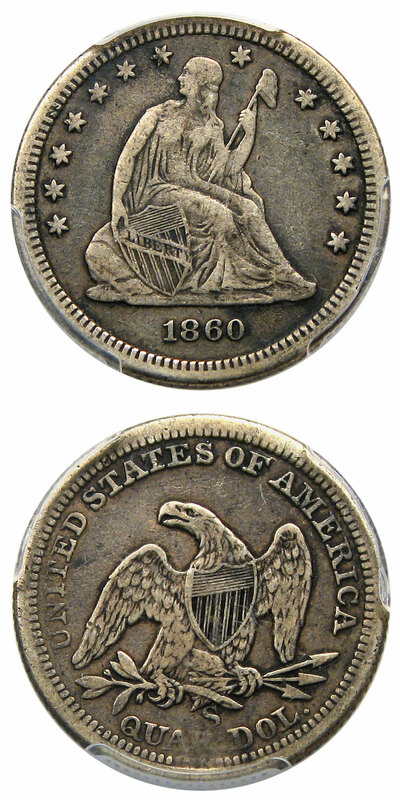 This 1861 is reserved for $19,500 in this week’s auction, and it seems like a fantastic value at that level. PCGS reflects a price of $22,000, which seems conservative to us due to the extreme lack of high-end examples on the market. Why we love it: The 1904-S has long been the key to the Barber Half set, and we’ve had the privilege of placing several over the years in gem grades. With only five PCGS-graded pieces finer, this example is one of four in the current grade. There are no other gem examples on the market currently, and with the last public auction record of such a piece being in 2014, the overall rarity of this gem is rather impressive. Value: We are offering this piece at a substantial reduction this week for just $34,000 via Make Offer. We have always loved the Barber series at DLRC, and this piece would be an excellent jumping off point for a developing collection of this truly undervalued series right now. Why we love it: Tied with one other piece as the Finest Known, this popular first year of issue with Drapery design is an absolutely gorgeous coin. The rainbow reverse toning with light and even rainbows on the obverse highlight this outstanding piece. In our opinion, this coin has no detractors, and we’re shocked that we still have in in stock. Value: Due to the end of the year, we’re offering this piece at a special reduced price of just $15,000 via Make Offer. This is slightly over our cost, and with the PCGS Price Guide sitting at $19,000 for such a piece, we think that this coin has the ultimate potential for someone who is willing to hang on to it for the long-term as it can simply not be duplicated. Why we love it: One of our favorite series, Mercury Dimes have been popular amongst collectors for nearly a century now. Other than the coveted 1916-D, the 1919-D is one of the key issues due to the lack of quality pieces that have survived in gem condition. This frosty 95% white gem is a special offering and worthy of consideration for the most advanced of collectors. Value: Available this week for our wholesale price of $19,250 via Make Offer, we are sure that this piece won’t last long. With PCGS standing at $25,000 and the fact that all three offerings from the last four years have garnered over $20,000 in auction, we think that this is an excellent value in today’s market. Why we love it: An absolutely perfect type coin with light, even wear, this early dime is the perfect example of early American history. We are proud to highlight it in this week’s Coins We Love. Value: PCGS Price Guide lists this piece at $10,500, but we’re pleased to offer it at a nearly 20% discount at our absolute best price of $8,750 via Make Offer. Why we love it: Hailing from a mintage of just 56,000 pieces, far fewer examples have survived. Pretty charcoal gray tones with even wear throughout, this piece is perfect for the advanced seated collector as this date simply does not appear often. Value: PCGS reflects a value of $5,750 and the wholesale Greysheet bid sits at $4,500 for a lower grade VF20. Offered via this week’s CWL, it has been reduced to $4,600 via Make Offer. An excellent deal on a truly scarce date. Auction 941 Lots Posted. Browse and Bid Now! Auction 940 Lots Posted. Browse and Bid Now!